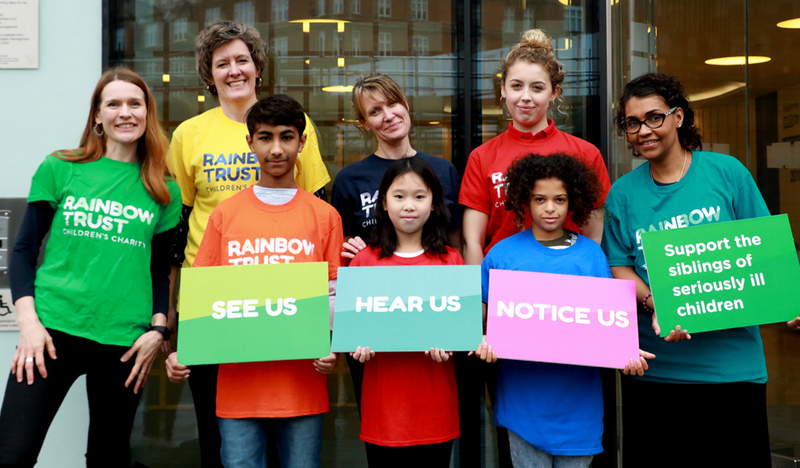 Rainbow Trust’s call for sibling support to be valued and funded more highly was delivered by siblings to government ministers in person this week. Siblings Hannah, Rose and Eddie, along with Rainbow Trust CEO Zillah Bingley, delivered an open letter to government which has now been co-signed by more than 200 parents, professionals and supporters. The letter was delivered to mark international Siblings Day on 10 April. It asks Care Minister Caroline Dinenage MP, and Children and Families Minister Nadhim Zahawi MP, to ensure all children and young people with seriously ill brothers and sisters have access to high quality sibling support when they need it – before their education, mental health and wellbeing are more seriously affected. Many co-signatories have left moving comments about their own experiences as parent or sibling. Hannah, whose brother has a rare genetic condition, said Rainbow Trust had made a big difference. ‘We’re in Westminster today to deliver a powerful message to ministers about the huge value of supporting siblings of seriously ill children, whose needs are all too often overlooked. More and more children are growing up with a seriously ill brother or sister as a result of medical advances, which is great news. But the services to support these siblings are poorly funded. Many local authorities have had to reduce any funding as budgets are squeezed. Sibling support from organisations like Rainbow Trust can help children learn important coping mechanisms and find an outlet for their strong feelings. Practical support can help them get to school and keep up with homework. Meeting other children in the same situation can also help them feel less isolated. Rainbow Trust’s report, See Us, Hear Us, Notice Us: The case for supporting siblings of seriously ill children, has been warmly welcomed by parents, adult siblings and professionals. The need for sibling support has been raised by several MPs in Parliament as a result.